Rimi acquires IKI: What changes are to be expected in retail market? On Friday morning it was officially confirmed that two major Lithuanian retail chains are merging – the owners of Rimi are acquiring Iki. What changes await consumers, employees and the whole market? He explained that due to the merger, three things are expected: larger sales numbers, increased supply chain efficiency and more effective marketing. According to the CEO, the merger of retail chains will take up 23% of the local market, with Maxima likely remaining the largest player with 39% of the market. E. Sesemann stressed that the deal still has to be approved by the Competition Council. Until the acquisition is confirmed, the chains will work as normal. “Through the integration process it will be decided if a single brand will be used or if both brands will remain. But this is to be discussed in the future,” he said, not denying the possibility a new brand would be created, but having two strong brands, the creation of an alternate third one is only one alternative. According to Sesemann the acquisition was decided on because occupying a smaller market share makes competing more difficult. The businessmen did not reveal how the number of stores or staff will change, this will be decided individually, looking at the results and prospects of each store. Due to the economies of scale achieved and operations optimisation, it is expected to save around 15 million euro annually from 2020. “We have around 300 free jobs, there is a lack of staff. Due to this, if closures or dismissals will be decided on, they will be offered to take up the free jobs,” said Country Managing Director for Rimi. 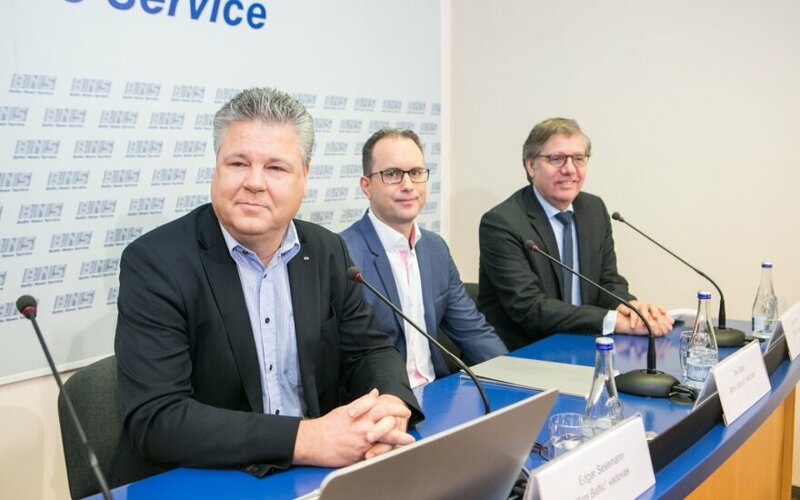 Rimi representatives stated that the entry of German retail chain Lidl had no impact on the deal, apparently it was begun prior to the newcomer announcing its entry. Public relations head for Iki Berta Čaikauskaitė stressed that until the merger is completed, no fundamental changes are expected in the operation of the companies. “We have informed our employees, partners and suppliers of this. Iki and Rimi remain competitors, while their operations are reviewed by the Competition Council and other institutions. Retail chain Iki has ambitious business aims and a confirmed action plan for 2017, these will definitely not change until the merger is complete. Though currently the process of merging is already being planned, all questions related to company structure, business processes, staff numbers and branding, we will be able to answer only after the merger,” she spoke and added that the merger of the two retail chains would benefit both of them. Rimi Lietuva, which belongs to the ICA Gruppen signed a deal with UAB Palink which owns the Iki retail chain. The value of the acquisition is 213 million euro to be paid in cash. The head of Palink Gerard Rog did not detail what will be done with the funds in possession of Iki currently. Together Rimi and Iki will take up a larger market share and will be able to compete more effectively. After the merger they will seek to strengthen offers for customers and to maintain the best of each company. “We believe in Lithuania and want to invest here. We will seek to strengthen our offers for customers, ensuring lower prices, a broad selection of local foods and to renew our stores. By merging the chains we will purchase larger quantities of goods from suppliers, we will have a more effective supply chain and marketing,” said E. Sesemann. “I believe that the experience of Iki in the retail market and particularly in regard to fresh food will be beneficial to the new company. The merger with Rimi will allow to provide even better services to Lithuanian consumers. We are happy with the new owner because it will allow to bring customer service to a new level,” stated G. Rog. After the acquisition Rimi Lietuva will become the second largest chain in the growing Lithuanian retail market. Currently the company is in fourth position. Iki stocks are currently controlled by Rewe Group, Coop Switzerland, Colruyt Group, Unilec, CONAD and UAB Baltisches Haus. The deal still has to be approved by competition regulators – confirmation is expected no later than Q4 2017. What market share will be occupied? In Lithuania there are 30 Rimi Hypermarket and 25 Rimi stores, the company Palink controls 235 Iki and Iki Express stores. Maxima LT states it controls 240 stores. Thus if Rimi and Iki merge, the new chain would exceed Maxima in store count. According to Sodra data Palink has around 7300 employees, while Rimi Lietuva has 3.3 thousand. Thus the combined staff count would be around 10 thousand. Based on this figure, Maxima would still be in the lead with its 16.5 thousand employees. Euromonitor International market analyst Jekaterina Smirnova told Delfi earlier that calculating the monetary value, 71% of the food retail market is currently shared by the four largest retail chains. “Looking at the past decade, Maxima has managed to maintain stable leadership, totalling 37% of the market. With the merger of Palink and Rimi Lietuva, the total number of their stores would exceed that of Maxima, but their market share would only be around 22%. Having such a market share, the merged chains will be unable to exceed Maxima in circulation and to take the first place in the food retail market. On the other hand the merger could help strengthen the positions of Palink and Rimi in terms of other players in the market such as Lidl, which is clearly resolved and intends to continue increasing its store count,” the analyst commented. Commenting on the acquisition some time ago marketing strategy consultant Linas Šimonis told Delfi that the Rimi and Iki chains lack uniqueness:“If we look at the Lithuanian market, realistically only two and the new third chain have clear identifiers. Maxima is the largest – the largest chain, the largest stores, largest promotions and etc. Norfa is the cheapest, though Lidl seeks to take the crown of the cheapest chain. Well, the Iki small stores are close to home, that’s all fine. Šimonis compared the merger with that of banks DNB and Nordea. They do not differentiate themselves from the competition and lacking that are unable to compete, thus marketing problems are resolved through mergers. “If the name of Rimi and Iki changed, it would be necessary to change many other things. If they only wish to satisfy the shareholders’ egos, then names are changed mechanically and thus something disappears. Nevertheless the format of these two chains is absolutely different. Changing the name of Iki stores to Rimi would be illogical, unless their formats are remade, assortments review and such. Then yes,” mused L. Šimonis.